Know Your Tax Credit on 26AS - Finance Dunia Home Loan | Car Loan | Education Loan | Life Insurance | Car Insurance Etc. Are you an Income Tax payer?Then you must want to view how much tax you have paid and how much tax paid by your employer.You can get all details of tax credit on form 26AS.This is very simple to view tax credit on 26AS. Tax deducted for how much amount. Details of Tax Deducted at Source for 15G / 15H . Details of Tax Deducted at Source on Sale of Immovable Property u/s 194IA(For Seller of Property) . Details of Tax Paid (other than TDS or TCS). Above details will help you to calculate your original tax deduction by your employer and tax submitted by your employer.You can easily calculate whether you have paid extra tax or you have to pay more Income Tax to govt. .Now come to the process of downloading or viewing Form 26AS. To check form 26AS you need to follow some simple steps. Step 1 : Open website of Income Tax Return .Now you need to login to view form 26AS and if you have not register yet then first register. Step 2 : Now you have logged in to e-filling site.On left hand site on quick link click on View Form 26AS (Tax Credit) =& Click on Continue & Now you have redirected to TDS-CPC website . 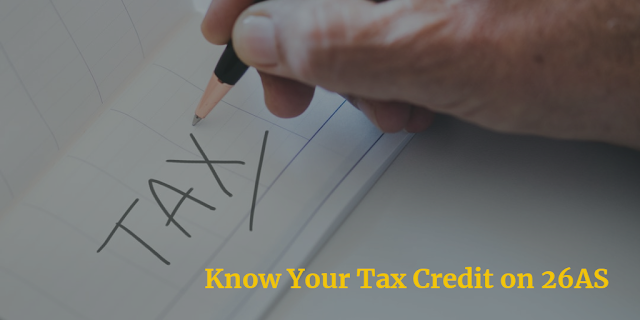 Step 3 : Click on View Tax Credit (Form 26AS) at below of the page to view form 26AS.Now select assessment year and format type to view.You may also download in PDF or Text by selecting on View As.Download form 26AS for each assessment year. I think this article helps you to view form 26AS.Please write problems and suggestions via comment.This will help me to know your requirement. This is very decent type of article. It makes a sense. Thanks to pushing this type of article. If any guests are interested on Personal Loan in Mumbai, you can contact by click on my name. I think it can help you. It’s good. It is helpful. Do anyone need personal loan in Mumbai? So check out on site by clicking on my name.